I am not a fashionista. For those of you who even remotely know me are probably chuckling at me even stating that fact. But truth be told, there was once a day where I didn't even have a clue. And to top it off, I was probably the world's biggest tomboy. 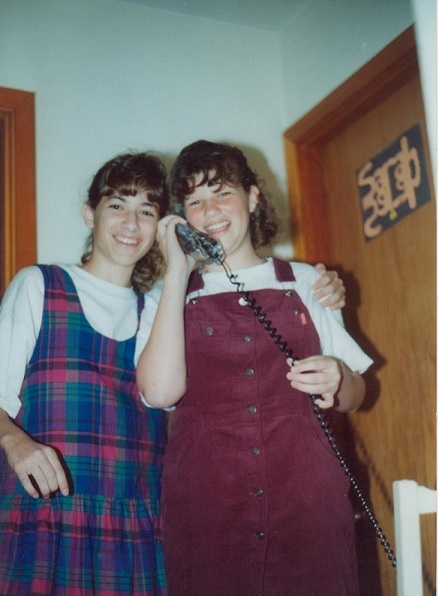 This week's theme for the Girl Talk Blog Hop is middle/high school fashion disasters. The picture I actually wanted to post for this blog hop is at my mom's house. It's an 8x10 of me in 8th grade. I was wearing white washed denim (tapered ankle at that folks! ), with leather boots, and a white and denim striped button down shirt. Yeah, it's awesome. Don't fear though, even though I couldn't find that picture, I had plenty to choose from today when I flipped through the albums. I have to be honest; I probably spent about 5 minutes trying to find a picture of me for this hop. It didn't take too long, but I didn't have that long to sit and ponder which one(s) to post. I chose two. The first of which was taken when I was almost 12. 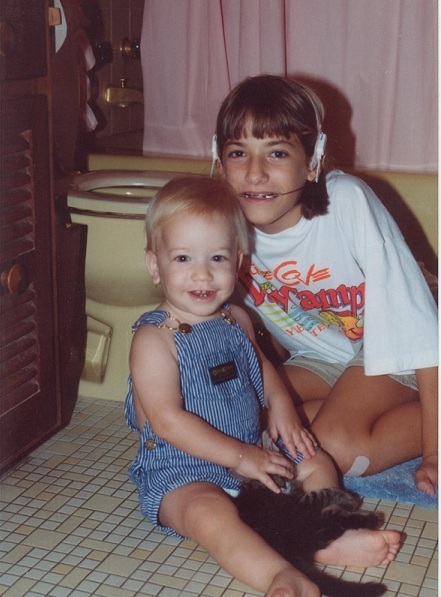 First off, I just have to say, I have no idea why my brother and I were in the bathroom together. WEIRD. What's even weirder is that I am wearing my head gear. You see, I had braces and a headgear like most middle schoolers. My problem is that I slept so soundly that I would roll over onto my headgear while I was sleeping, and consequently the brackets on my back teeth would pop off. After the 3rd one, the orthodontist said that I would have to pay for it. So my parents told me I needed to wear the head gear during the day (thank God I was homeschooled-- could you imagine the horror of having to go to school looking like this?!?!). The second picture was taken when I was 13. In 1995. Yes. I am wearing a jumper. And I'm pretty sure if it was a full body shot I would have Keds on. I know, I know. Quit thinking about how you wish you were as cool as I was...(and check out the curly bangs!). If you wanna join in the fun, just head on over to Girl Talk to link up!